Last Saturday night, on the undercard of the action packed UFC 232 card, former Invicta champion Megan Anderson picked up an impressive first-round win over Cat Zingano — but probably not quite the way she imagined. Although it was a well-timed head kick that set up the finish for Megan Anderson, it was an inadvertent toe to Zingano’s eye that ended the action. Post-fight, this victory generated some debate and controversy on social media, as some members of the combat sports bubble wondered why a toe to the eye should be treated any differently than a finger to the eye. Whatever the case, Megan Anderson left the cage with one of her biggest wins to date, and at the end of the day, that’s what’s important for her. Speaking on Instagram post-fight, she reflected on her victory over Cat Zingano, and just as she did in her post-fight interview with Joe Rogan, offered the former UFC bantamweight title challenger a rematch. “A win is a win. Not how we wanted it to go but we’re just doing our job,” Megan Anderson wrote. 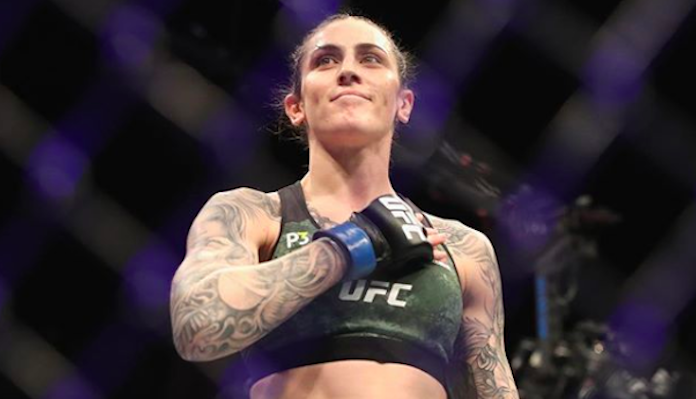 What do you think the future holds for Megan Anderson after UFC 232? Do you think Cat Zingano deserves a rematch? ← Alexander Gustafsson: What Went Wrong Against Jon Jones?